The Brontë Parsonage Museum is gearing up for a busy week of activities in the forthcoming half-term holiday which will culminate with the Brontë Society’s AGM Weekend. On Bank Holiday Monday the Parsonage will be inviting children to find out more about the toys that the Brontës might have played with as children and try their hand at making some old fashioned action toys of their own. The ‘Toytastic’ activity is free with the normal admission charge to the museum and is running on a drop-in basis with children welcome to join in the fun and make a toy anytime between 10.30am to 4.00pm. On Wednesday 2 June short talks and guided walks focusing on the Brontës and the fascinating history of Haworth will be taking place throughout the day. Again these will be free for both adults and children. Friday 4 June is a ‘kids go free’ day at the museum, with children up to the age of 16 able to come into the museum completely free of charge. Friday also sees a new exhibition of paintings open at the museum. The art works are based on Brontë dresses and have been produced by artist Victoria Brookland who will be talking about her work at the West Lane Baptist Centre at 3.30pm - admission £5 or free to day ticket holders to the museum. On Saturday 5 June, local children’s author, Robert Swindells will read from and talk about his Branwell Brontë inspired book, Follow a Shadow (10.00am at the West Lane Baptist Centre) and the Brontë scholar Lyndall Gordon will lecture on the influence of the Brontës on the nineteenth-century American poet Emily Dickinson (11.00am, also at the Baptist Centre). Later that evening, two influential literary scholars, Lucasta Miller and Elaine Showalter, will be in Haworth to discuss the influence of the Brontës on womens’ writing generally. The event, which also takes place at the Baptist Centre at 8.00pm, is a rare opportunity to hear the US based critic Showalter. Tickets are £10. On Sunday 6 June renowned graphologist Diane Simpson will discuss her fascinating research into the Brontës’ handwriting and what it reveals about Charlotte, Branwell, Emily and Anne. This event takes place at the Baptist Centre at 3.00pm and tickets are £7. Throughout the week, from 31 May to Friday 4 June, 2 for 1 vouchers will be available at various shops and tea rooms in Haworth enabling two people to enter the museum for the price of one. For the first time in over 160 years the Brontë family’s cabinet piano is to be heard again at their former home in Haworth. This historic occasion will take place at the Brontë Parsonage Museum in June following months of complex conservation work, which were made possible through the generosity of Florida member Virginia Esson. 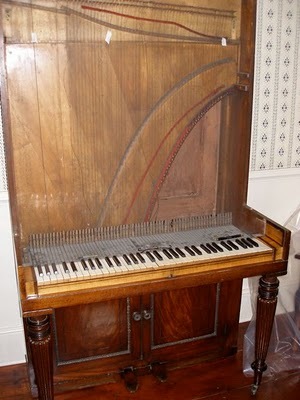 The piano was originally made by John Green of Soho Square. It is not known for certain when the Brontës acquired their piano. Branwell Brontë developed a talent for both piano and church organ and it was possibly at his instigation that the instrument was acquired. Emily was described as playing ‘with precision and brilliancy’, and during her time as a student in Brussels, her ability warranted the services of the best available professor of music. Anne preferred to sing, though she was able to accompany herself on the piano. The family exception was Charlotte, whose poor eyesight proved an impediment to sight reading. The piano has an interesting history: it was lent to Mr Grant, the curate of Oxenhope by Patrick Brontë after his children’s deaths, and then sold at an auction of Brontë items in 1861. It then passed through numerous hands before being put up for sale at Sothebys in 1916 as part of the collection of J.H. Dixon. Dixon’s wife was not satisfied with the price offered and withdrew the piano from the sale, presenting it instead to the Brontë Museum in memory of her husband. The piano was valued by many of these former owners as a relic of the remarkable Brontë family. Over the years little interest has been taken in it as a musical instrument and it was no longer in playable condition. Recently the piano has undergone a lengthy and complex restoration process carried out by a specialist conservator and made possible by the generosity of an American Brontë Society member. 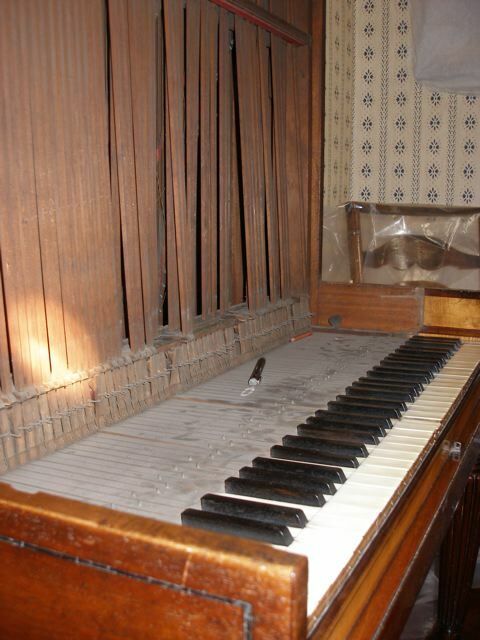 Many of the internal workings were either damaged or missing and the restoration was further complicated by the piano’s rarity and the lack of similar instruments available for comparison. Cabinet pianos were popular in the 1830s and 1840s but today are rather unusual when compared to the more valuable pianos such as the Grand. The piano will be back on display at the museum from Thursday 3 June. It will be played on the evening of Friday 4 June 2010, at a special event for Brontë Society members. Music has been carefully selected from the archive at the museum and will be played by Maya Irgalina from the Royal Northern College of Music. Further events are now being planned to allow the public to hear the piano played on a regular basis. http://www.huffingtonpost.com/2010/05/10/bronte-sisters-action-fig_n_569985.html with his comment "it had to happen sooner or later!" The spoof commercial can be seen directly on YouTube HERE. Thanks to Maddalena De Leo, some of the lectures given at the Brontë Society's York Conference last year are now on YouTube. Try this one by Dudley Green. On the Saturday of the annual June weekend (5th) there will be a ghost hunt at the Black Bull, Haworth's most famous public house, which stands in a little cobbled square at the top of Main Street near to the church steps. It will start at 11pm. The pub was, of course, frequented by Patrick Branwell Brontë. He drank there until his death in 1848 at the age of thirty-one. The Black Bull still houses Branwell's Chair, where he sat during his many visits. The Black Bull is believed to be haunted and was featured in the Most Haunted television series. A psychic events company (Ghostparanormal) is to present the event,with a full investigation of the building and the adjoining land. The tickets (at £25) cover food, the use of equipment for investigating the paranormal, and much more. This sounds like it will be a entertaining and interesting evening, because at least a couple of the rooms are said to be haunted. This event has been organised by the pub and the events company. Tickets are available from the Black Bull - 01535 462249 or from Mark - 01422 241049. The Brontë Parsonage will be opening its doors for a series of very special ‘behind the scenes’ tours on the 18th, 19th and 26th May, 7.00pm. Each evening will include a guided tour of the museum, a visit to the museum’s Library and a special opportunity to see some of the treasures of the museum’s collection at close quarters. Wine and canapés will also be served. The museum is not able to offer guided tours during normal opening hours due to limited space, and its Library, which was part of a Victorian extension added on to the Brontë house in the 1870s, is usually open only by special appointment for research purposes. The museum; which houses the world’s largest collection of Brontë manuscripts, letters and artefacts; is only able to display around 10% of its collections and the special tours will provide an opportunity for people to see some of the rarely seen treasures of the collection. There will also be the chance to find out more about the history of the museum’s collection and how it is cared for and to see some of the museum’s most recent acquisitions. I’m sure these special evenings will be extremely popular. The guided tour will give people a wonderful insight into life at the Parsonage in the Brontës’ time and the chance to see the museum’s unique Library and some of the wonderful Brontë treasures it contains. It’s a very special experience indeed. Along with wine and canapés, it will all make for a delightful evening.